That there is power in the wind is not a new discovery. Man’s been using the wind for thousands of years. What most people don’t realize is how much experimentation has been going on in this century. Wind energy is nothing new in America. The idea of windmills was brought here by early European settlers, and used in many ways, to power grinding mills, and later to pump water for the steam locomotives, that connected New York and San Francisco…and to supply water for farming. During the 1940s, large wind generators, which could provide power to many users were introduced. Towering above Grandpa’s Knob, near Rutland Vermont, the Smith-Putnam turbine fed electricity to a Vermont Utility company. This system was designed to produce up to one and a quarter megawatts of electricity. One megawatt equals one million watts, or enough electricity to light ten thousand one-hundred watt light bulbs. But with the advent of cheap fossil fuels, wind power was neglected. Now, with new materials, new techniques, and information age tools, it’s a cutting edge technology once again, creating new industries worldwide. The annual growth of the global wind turbine industry, has for many years been well over 25 percent, and this level of growth looks set to continue. In 2020, the number of employees in the industry worldwide is expected to grow from 350,000 to 2 million. The main challenge with wind energy is to ensure a constant and reliable source of energy supply to consumers, and how do we do that when the energy source fluctuates? Wind is powerful, but intermittent. That’s a problem. But here’s a little secret. All sources of power are intermittent. There is no power plant, coal, nuclear, or gas, that is available 100 percent of the time. The electrical grid is built with this in mind. A well functioning coal plant, will not be available 44 days of the year. For nuclear, it’s 36 days, as well as 39 days for refueling every 17 months or so. 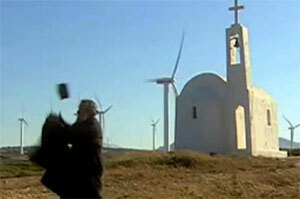 Wind power has a failure rate of only 2 percent, and units rarely go down all at once. Wind is predictable on a scale ranging from hours to days, and winds tend to die off gradually, allowing for grids to adjust. When conventional plants fail, they often fail completely, unexpectedly, in milliseconds, which is a major challenge for grid operators. This type of failure gave rise to erroneous reports, that a power shortage in Texas was once caused by low wind conditions. [Loss of wind causes Texas power grid emergency, Reuters, Feb 27, 2008] In fact, an official investigation of the incident [ERCOT study of “loss of wind” event: ERCOT’s Operations Report on EECP Event] showed that unpredicted high demand, and the failure of a large conventional unit triggered the short-lived pinch, which did not result in any customers losing power. Global experience has shown that a well interconnected grid makes outages from any source increasingly unlikely. A strong and well developed electricity grid, within Denmark and to the neighboring countries, transmits energy from the wind turbines out to where consumers are. Denmark is part of a strong electricity market, where electricity can be bought and sold. ….all in all to accommodate supply and demand and to insure competitive and fair prices for electricity. A national transmission system operator insures that the actual generation of electricity, and its actual consumption, always balance, by asking the power stations to step on the brakes, or to step on the accelerator, or through import and export to neighboring countries. And energy can be stored as well. A well known technology is pumped storage, where water pumped uphill during times of low demand, is usable during times of high peaks. By taking energy from the wind, and by building large hydro energy reservoirs, we can make energy from the wind fully reliable and usable. Switching to our own natural energy, Ireland will save huge sums, and export power to earn great wealth. Yet another off-the-shelf technique is using electricity during times of low demand, to compress air, which is stored underground. When it’s needed, the valves are opened, the air drives turbines, and produces renewable power on demand. Another question about wind turbines is their impact on birds and wildlife. Stories abound about impacts on bird populations. According to US Government research, wind turbines killed 20 to 37 thousand birds in 2003, with all but 9,200 of those kills occurring in California. Where does that put wind turbines compared to other hazards that birds face? There wasn’t an awareness about the magnitude of this problem. Reasonable estimates place the mortality between a hundred million and a billion native birds dying in North America each year in window collisions. They hit the glass and they die. House cats kill hundreds of millions, perhaps billions of birds, each year in the US. Clearly bird populations are under stress – but wind turbines are not the primary culprit. A great deal of the mythology around wind and birds comes from one location in California. The Altamont Pass wind array originally included thousands of small, fast spinning turbines. Proximity to bird habitat made this wind farm particularly deadly. But as obsolete designs are replaced, and better siting critera applied, the problem is easing. With good management, the wind industry may be able to remain a very small contributor to bird mortality – like the less than 3 thousandths of a percent (0.003%) in the National Academy study. Many intrepid YouTubers have taken to the field to investigate another charge against wind turbines – that they’re noisy. Just how loud is that? We’re –ckin what? That’s at least a megawatt. The poster child for the resurgent wind industry is usually Denmark, but there is another emerging player that may change the industry dramatically. China is looking to be the wind power market in the world by the end of this year. Over the last 4 years we have been seeing doubling of installation capacity every single year, so in 2005, China had cumulative capacity of just 1.3 gigawatts. Now in end of 2008, we’re talking about 13 gigawatts. I think people were fully expecting this year, may not be doubling again, but at least 80 or 90 percent growth, so we’re talking about 20, 25 gigawatts by end of 2009, so that’s a growth no one in the world has experienced previously. Just 5 years ago, there was really only one Chinese wind turbine manufacturer. Today, we see about 80 wind turbine manufacturers in the Chinese market place. The United States has experienced explosive growth in wind energy, and leads the world in installed capacity. One reason is that the cost of wind power has now become more than competitive with fossil and nuclear power. 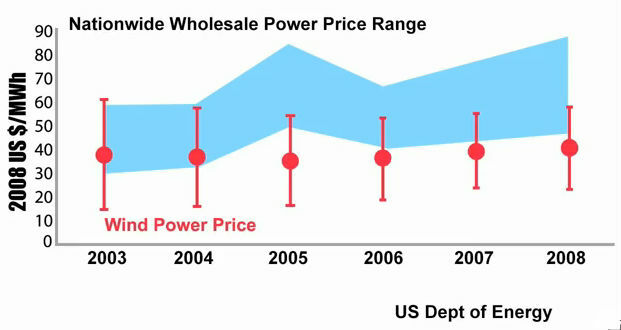 In fact, the financial letter Bloomberg News recently reported a new phenomenon related to wind power — negative pricing. [Windmill Boom Curbs Electric Power Prices for RWE, April 23, 2010] On windy nights in northern Germany, consumers are paid to keep the lights on. Twice this year, the nations 21,000 wind turbines pumped out so much power that utilities reduced customer bills for using the surplus electricity. Negative electricity prices happen when we literally don’t know where to put it, and we’ll see this happen more often in the future. there is no shortage of energy..
to reach out, and tap it…. Nice additon to the site and conrats on the win! I just posted a thread on how individuals can purchase carbon offsets. Have you considered that as a future topic? in general, but don’t know if we will have a bill before I can get to it, so might hold off until we see what kind of a bill is past. My friend this is complete fiction. Wind energy is not available on 2% of the time? Nuclear is down 40 days every 17 month? It is more like 25 days every 18 month. Wind doesn’t work when is isn’t windy something like 70% of time. This is called lying! I know you need to exaggerate to pretend wind is the finally solution. In Massauchausetts Nuke is 10% of total power generation but generate 20% of the power because it is cheap, clean and work 99% of time all day long everyday between refueling. Tell me how much of the day does the wind blow? Our navy uses nuke power on all it submarines and aircraft carriers…why don’t they use wind power on the aircraft carrier? Because it would be a joke. If you want real solution to power generation then you need to think bigger. Wind energy is natural disaster in the making at hundred of thousand of these industrial towers ruin every open space in the country!!!! And yes I won’t mind nuclear power in my neighborhood….if navy personnel can live under water 50 ft from one…then we can build a couple in our country. The failure rate for individual wind turbines is only 1 or 2 percent. 70 percent is a little high for new wind arrays, according to DOE stats. Wind is certainly not the final solution, but right now, it’s beating the pants off nuclear. ratepayers, were bought for a song, are in fact now operating pretty cheaply. it right now, other than managed economies where cost is no object and no one has a choice.